This compass is carved in rock showing cardinal points. For some reason the N mark is backward and a W mark is upside down. A surrounding circle of 10 inches in diameter defines most of the compass. A smaller circle encompasses the letter N and a partial circle carved from the center is approximately 4 inches in diameter. The square 14.5-inch dial is made of while milk stone with graphics highlighted using lithochrome paint. The gnomon is made of stainless steel 303-alloy and has the letter P held between the base and style. The dial sits upon a square frustrum pedestal 3-feet tall, 24-inches square at the base, tapering to 17.5-inches at the top. The pedestal is supported on a 32-inch square base. Stonehenge-like half-scale model. 5 trilithons. A south-facing trilithon carries a pierced brass plate which projects a spot of sunlight on a folded analemma pattern. Stone. This horizontal sundial is a 30 inch diameter and 1.5 inch thick sealed, copper-coated steel plate with cast lead hour markers and weighs 250 pounds. Built in 2002, it was installed in September, 2004 in a private home rear yard. Dial is supported by 6x6 inch pressure treated wood post with 4x4 inch cross frame. Viewing can be arranged by contacting the owner. A vertical dial of limestone and copper held in the hands of an angle statue. This modernistic vertical south declining dial was designed by Mel Meyer and installed in 1989. 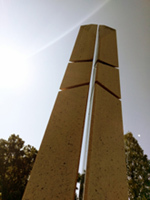 The dial is an 8 by 10 foot stainless steel sundial with ribbed hour lines. No numerals are used. The gnomon is a solid triangle 3.5 inches wide by 85 inches high. The circular bronze dial has a massive triangular gnomon and is kept under a protective plastic dome. In R. McGuire's book, St. Louis Arsenal - Armory Of The West is a picture of the sundial for which the caption reads "On December 12, 1859, master armorer N. Engels, machinist A. Schaedel, and engraver W. Hawksley dedicated a sundial, which they had created entirely from spare ordnance materials. It was a scientifically precise instrument, measuring 17 inches in diameter, and was used for many years as the definitive chronometer of the arsenal. Engraved upon it was a poem entitled 'The Bird of Liberty,' reflecting the patriotic fervor of the day." 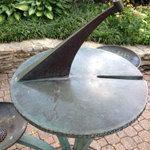 The original sundial, made in 1841, was 14 inches in diameter and sat on a limestone pedestal 30 inches high. In early drawings from the late 1890's and later photos, the dial had a massive triangular gnomon. For years it served as the post chronometer. A child-safe compliant surface analemmatic dial located in a roof garden. The dial face includes hour numerals, cardinal directions and moon phases. A nearby plaque give directions for use. A 16.5 inch diameter bronze horizontal dial on a stone pedestal in front of the south entrance to the glass-walled Jewel Box building in Forest Park. The dial was erected by the Missouri Society Colonial Dames of America as a tribute to the memory of Mary Harrison Leighton Shields, who organized the Society in 1896 and served as its president until 1913. The dial face is inscribed, "WE LIVE IN DEEDS NOT YEARS." Dial furniture includes an hour glass and eagle wings. The perimeter around the dial is inscribed, "MARY HARRISON LEIGHTON SHIELDS." Dial sits atop a stone pedestal. 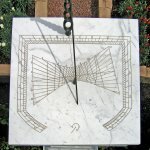 A unique horizontal dial 28 inches square and 1 inch thick of white Carrara marble with two cast bronze gnomons. Four time systems are shown on the dial. 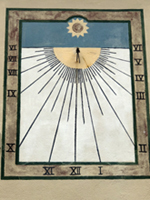 The shadow of the short vertical gnomon near the dial center indicates Ezanic hours based on a 24 equal-hour day with two 12-hour periods starting at sunset; Babylonian hours similarly based on two 12-hour periods starting at sunrise; and two Moslem prayer times, Zuhr and Asr. 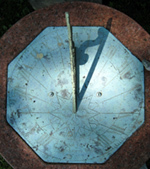 The polar gnomon shadow indicates hours based on two, 12 equal-hour periods starting at noon and midnight. The polar gnomon support consists of seven rings representing the celestial spheres of Sun, Moon, Mercury, Venus, Mars, Jupiter and Saturn. Dial furniture includes a Qibla showing the direction to Mecca, N 42.7° for this location. Dial markings are accentuated with inlaid gold leaf. This dial design is based on the Ottoman dial at Topkapi Palace, Istanbul, built about 1480, and on Ibn Al Shatir's dial in Damascus built 1371, the first sundial with a polar gnomon. Dial rests on three large carved marble blocks 42 inches high. The Botanical Gardens are public but require a moderate admission fee. The circular bronze dial sits on an iron pipe, surrounded by a picket fence and protected from the elements by a brass hood. It is a nearly identical dial to the one at the St. Louis Arsenal (NASS dial #847), and was manufactured in the same year, 1859. It is likely that master armorer N. Engels, machinist A. Schaedel, and engraver W. Hawksley created this dial. The obelisk is constructed of North Carolina pink granite. At the base it is 18 x 16 inches and soars 18 feet into the sky. The obelisk displays a cross in its own shadow at solar noon on three days each year – the vernal equinox on about March 21, the summer solstice on about June 21, and the autumnal equinox on about September 22. Sitting on a classic sundial pedestal is the Concordia sundial made of thin bronze plate in the shape of a hexagon about 8 inches between opposing sides. Hour lines radiate from where a thick gnomon would have stood, with Arabic numbers from 4am to 8pm counting the hours. The gnomon had gone missing in 2009 when the dial was vandalized. A new gnomon fitting the position of the old was designed by Don Snyder of St. Louis and made of bronze plate by William Turner of Turner & Associates, a metalworker also of St. Louis. This horizontal sundial is part of a sculpture set, formed as a lily pad, and surrounded by three circular flowers with centers that are small water fountains (no longer working). The dial face is no longer flat and the graceful gnomon does not point true north. There is a short cylinder at the end of the gnomon with a hole, perhaps for casting a beam of light on a certain day. The hole is at a 34.4 deg angle, aiming toward the slot in the dial face. Now, the dial is located in dense shade preventing operation. A vertical decliner at the top of the Cupples I building. Given by the class of 1908. Can be seen from the courtyard of Robert S. Brookings building. In 1908 the campus newspaper, the Washington University Student Life, commented that "The new sun dial on Cupples I is now being put into position upon the tablet on the south side of the building?It will be interesting to note the discrepancy between sun time and standard time by comparing with the Varsity clock [a large time piece situated high on the west wall of Brookings Hall, with both clock and dial visible in the quadrangle]." Today the Baumont Pavilion, erected in 1965, blocks a close view of the ornate tablet and dial. Use binoculars from a distance. This horizontal sundial is mounted on a hexagonal graceful concrete pedestal 43 inches high. The top of the pedestal is slightly sloping hexagonal 17 inches on a side. The circular bronze dial at the center is 11 inches in diameter. The hour lines meet a chapter ring with time marked in 15 minute intervals. Roman numerals mark the hours from 6am to 6pm. The 5 1/2 inch gnomon is of badly rusted steel, with iron stains covering the central part of the dial face. The sundial was vandalized at some time in the past and the original gnomon stolen.